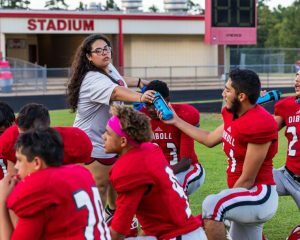 Junior student trainer Lesly Zuniga hands out bottled water for players during half time at a Diboll High School junior varsity football game at Lumberjack Stadium in Diboll. 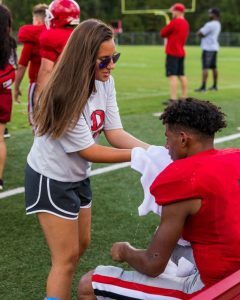 Freshman student trainer Clohe’ Wall dabs ice water on a football player’s face during a Diboll High School junior varsity football game at Lumberjack Stadium in Diboll. 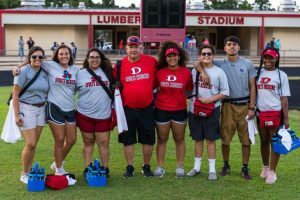 Diboll High School trainers pose for a photo during a junior varsity football game at Lumberjack Stadium in Diboll. From the left are SFA graduate student trainer Danielle Buckholdt, freshman student trainer Clohe’ Wall, junior student trainer Lesly Zuniga, head athletic trainer Mike Waters, senior student trainer Alivia Jackson, freshman student trainer Eli McGaughey, SFA graduate student trainer Aaron Chavez and freshman student trainer Makaiah Moore. 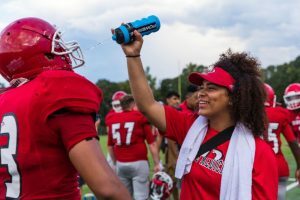 Senior student trainer Alivia Jackson sprays water into a football player’s mouth in between plays during a Diboll High School junior varsity football game at Lumberjack Stadium in Diboll. Lufkin Daily News recently wrote an article about the “Unsung heroes of high school sports: Record high number of Diboll student athletic trainer aides prep for new season.” Above are the pictures from the article and click on the link below to read their article.